VIENTIANE, Laos—Decades after the US gave Laos a horrific distinction as the world’s most heavily bombed nation per person, Secretary of State Hillary Clinton pledged on Wednesday to help get rid of millions of unexploded bombs that still pockmark the impoverished country—and still kill. 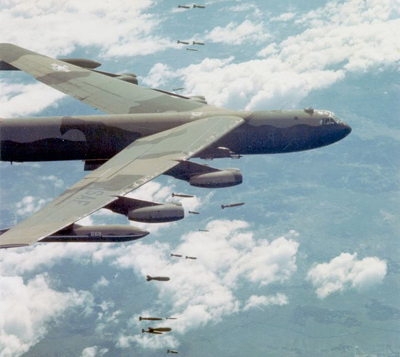 The US dropped more than two million tons of bombs on the North Vietnamese ally during its “secret war” between 1964 and 1973—about a ton of ordnance for each Laotian man, woman and child. That exceeded the amount dropped on Germany and Japan together in World War II. Four decades later, American weapons are still claiming lives. When the war ended, about a third of some 270 million cluster bombs dropped on Laos had failed to detonate. More than 20,000 people have been killed in Laos since then by ordnance, according to Laos’ government, and agricultural development has been stymied. Clinton, gauging whether the nation can evolve into a new foothold of American influence in Asia, met with the prime minister and foreign minister, part of a week-long diplomatic tour of Southeast Asia. The goal is to bolster America’s standing in some of the fastest growing markets of the world, and counter China’s expanding economic, diplomatic and military dominance of the region. Laos is the latest test case of the Obama administration’s efforts to “pivot” US foreign policy away from the long wars in Afghanistan and Iraq. The efforts follow a long period of estrangement between Washington and a former Cold War-era foe, and come as the White House’s relations also warm with countries such as Burma and Vietnam. In her meetings, Clinton discussed environmental concerns over a proposed dam on the Mekong River as well as investment opportunities and the joint efforts to clean up the unexploded bombs dropped across Laos over what was once called the Ho Chi Minh trail. Greater American support for programs in these fields will be included in a multimillion-dollar initiative for Southeast Asia to be announced later this week. Clinton visited a Buddhist temple and a US-funded prosthetic center for victims of American munitions. There, she met a man named Phongsavath Souliyalat, who told her how he had lost both his hands and his eyesight from a cluster bomb on his 16th birthday, four years ago. “We have to do more,” Clinton told him. “That’s one of the reasons I wanted to come here today, so that we can tell more people about the work that we should be doing together.” Although the US bombed Laos to loosen its alliance with the North Vietnamese, the current Vietnamese government focuses its efforts in Laos on recovering its own dead, more than cleaning up unexploded bombs. Cleanup has been excruciatingly slow. The Washington-based Legacies of War says only one percent of contaminated lands have been cleared and has called on Washington to provide far greater assistance. The State Department has provided US $47 million since 1997, though a larger effort could make Laos “bomb-free in our lifetimes,” California Representative Mike Honda argued on Wednesday. “Let us mend the wounds of the past together so that Laos can begin a new legacy of peace,” he said. The US is spending $9 million this year on cleanup operations for unexploded ordnance in Laos and is likely to offer more in the coming days. It is part of a larger Obama administration effort to reorient the direction of US diplomacy and commercial policy as the world’s most populous continent becomes the center of the global economy over the next century. It is also a reaction to China’s expanding influence. The last US secretary of state to visit Laos was John Foster Dulles in 1955. His plane landed after a water buffalo was cleared from the tarmac. At that time, the mountainous, sparsely populated nation was near the center of US foreign policy. On leaving office, President Dwight D. Eisenhower warned his successor, John F. Kennedy, that if Laos fell to the communists, all Southeast Asia could be lost as well. While Vietnam ended up the focal point of America’s “domino theory” foreign policy, Laos was drawn deeply into the conflict as the US helped support its anti-communist forces and bombed North Vietnamese supply lines and bases. Landlocked and impoverished Laos offers fewer resources than its far larger neighbors and has lagged in Asia’s economic boom. It remains one of the poorest countries in Asia, even as it hopes to boost its development with accession soon to the World Trade Organization. In recent years, China has stepped up as Laos’ principal source of assistance, with loans and grants of up to $350 million over the past two decades. But like many others in its region, Laos’ government is wary of Beijing’s intentions. And it has kept an envious eye on neighboring Vietnam’s 40 percent surge in commercial trade with the United States over the past two years, as well as the sudden rapprochement between the US and nearby Burma, also known as Myanmar. Persistent human rights issues stand in the way of closer relations with Washington. The US remains concerned about the plight of the ethnic Hmong minority, most of whom fled the country after fighting for a US-backed guerilla army during the Vietnam War. Nearly 250,000 resettled in the United States. The US has pressed Laos to respect the rights of returnees from neighboring countries. Washington also has been seeking greater cooperation from Laos on the search for US soldiers missing in action since the Vietnam War. More than 300 Americans remain unaccounted for in Laos. And the US is pressing the Laotian government to hold off on a proposed $3.5 billion dam project across the Mekong River. The dam would be the first across the river’s mainstream and has sparked a barrage of opposition from neighboring countries and environmental groups, which warn that tens of millions of livelihoods could be at stake. The project is currently on hold, and Washington hopes to stall it further with the promise of funds for new environmental studies.